On Friday, July 26, the 60th anniversary of the assaults on the Moncada regiment in Santiago de Cuba, and the Carlos Manuel de CÃ©spedes Garrison in Bayamo, arrived. I know that many delegations plan to travel to Cuba, to spend with us this date, on which our small, exploited island decided to continue the uncompleted struggle for the independence of our homeland. Already, at that time, our movement was strongly influenced by the new ideas which were being debated around the world. Nothing is repeated exactly the same in history. SimÃ³n BolÃ­var, AmericaÂs Liberator, proclaimed one day his desire to create in America, the largest and most just of nations, with its capital in the isthmus of Panama. This tireless creator and visionary was ahead of his time, later saying that the United States appeared to be destined to plague America with misery in the name of liberty. Cuba suffered, as did South America, Central America and Mexico – its territory stolen with blood and fire by the insatiable, voracious northern neighbor which took its gold, oil, fabulous sequoia forests, its best lands and richest, most abundant fishing waters. I will not, however, be with you in Santiago de Cuba, since I must respect the obvious resistance of the guardians of my health. I can, nevertheless, write and send you my ideas and recollections, which will always be useful, at least for the person who is writing. A few days ago, as I observed, from the middle seat of a 4-wheel drive vehicle, what had been an old genetic center for milk production, I was able to read a brief, synopsis of just one paragraph from a speech I made on May Day in 2000, already 13 years ago now. Time will erase those words written in black letters, on a white-washed wall.
] is struggling with audacity, intelligence and realism; it is never lying or violating ethical principles; it is a profound conviction that there is no power in the world that can crush the power of truth and ideas. Revolution is unity; it is independence, it is struggling for our dreams of justice for Cuba and for the world, which is the foundation of our patriotism, our socialism and our internationalism." Now that it has been 60 years since the events which occurred in 1953, no doubt valiant and demonstrative of our peopleÂs capacity to be creative and confront any task, starting from zero. Subsequent experience taught us that it would have been safer to begin the struggle in the mountains, something that we had planned to do if the Moncada had been taken and we were unable to resist the dictatorshipÂs military counter-offensive with the weapons we had in Santiago de Cuba, more than enough to triumph in that conflict and much more rapidly, in less time than was later invested. The 160 men chosen for the operation were selected from among 1,200 we had trained, among youth in the provinces of Havana and Pinar del Rio, affiliated with a radical Cuban national party, at a time when a petty bourgeois spirit instilled by foreign owners, and their communications media, still influenced many, in all corners of the country, to a greater or lesser degree. I had had the privilege of studying and had already acquired a political consciousness at the University, having started from zero. It is worth repeating what I have said on other occasions. I created along with Abel SantamarÃ­a and JesÃºs MontanÃ© the movementÂs first Marxist cell, utilizing a biography of Karl Marx written by Franz Mehring. The Communist Party, with serious and dedicated members in Cuba, was subjected to the vicissitudes of the international Communist movement. The Revolution, reinitiated July 26th, captured experiences from our history, the selfless and combative spirit of our working class, the intelligence and creativity of our writers and artists, as well as the ability latent in the minds of our scientists, which has grown exponentially. The present appears nothing like the past. We ourselves, those of us who chance called upon to play a leadership role, could be embarrassed by the ignorance which our knowledge still reflects. The day we fail to learn something new is a day lost. Human beings are the product of rigorous laws which govern life. Since when? Since an infinite time ago. Until when? Until infinite time. Answers are as well. I therefore respect the right of human beings to seek divine answers, although I donÂt agree with them. Questions may be asked, as long as they do not tend to justify hate or lack of solidarity in the heart of our own species, an error which many have fallen into, at one or another moment in history. That daring attempt was no doubt an improvised action. I confess that based on accumulated experience, it would have been more realistic and safer to have initiated that struggle in the mountains of the Sierra Maestra. With the 18 rifles we managed to gather after the very difficult setback we suffered in AlegrÃ­a de PÃ­o, in part as a result of inexperience and not following instructions received by the movement in Cuba, and also because of our excessive confidence in the expeditionariesÂ fire power, having more than 50 rifles with telescopic sights and in their shooting training. Attentive to the low-flying passes of the enemyÂs combat planes, we neglected our ground vigilance and they attacked from a small hill a few meters from us. The enemy was never again able to surprise us that way. In the battles unleashed later, it was always the opposite, and in the final actions, in incessant fighting over 70 days, we defeated the offensive of more than 10,000 men from their elite forces, with less than 300 combatants. In the battles fought over two years, the bombers and fighter planes of the enemy would be on top of us within 20 minutes. There is no evidence, however, that one combatant died for this reason during that difficult struggle. Everything changed in the following decades with new technology developed by the United States and added to the arsenals of reactionary forces in Latin America and the world allied with them. Peoples always found adequate ways to struggle. You will be there, at the scene of the first battle. After the events on July 26, one last car approached to pick me up and I got in the back seat of the vehicle full of personnel. Another combatant approached from the right; I got out and gave him my seat. The car left and I was left alone. Until the moment they picked me up the first time, in the middle of the street, with my semi-automatic Browning and 12 caliber shot cartridges, I tried to prevent two men from using a 50 caliber machine gun on the roof of one of the buildings of the large military installationÂs central command. It was the only thing to be seen of the generalized fire fight that could be heard. The few compaÃ±eros with whom Ramiro ValdÃ©s was able to enter the first barracks awoke the soldiers sleeping there and, as they later told to me, were in their underwear. I wasnÂt able to talk with Abel, or others in his group, who controlled the rear of the dormitories from a tall building at the back of the Civilian Hospital. I thought that it must have been absolutely obvious to him what was occurring. Perhaps he thought I had died. RaÃºl, who was with Lester RodrÃ­guezÂs group, could clearly see what was going on and thought we were dead. When the head of this squadron decided to come down, take the elevator and arrive below, he grabbed the sergeantÂs rifle. He did not resist, nor did any of the soldiers with him. RaÃºl took command of the group and organized their exit from the building. At this moment, my fundamental concern was for the group of compaÃ±eros who were supposedly occupying the garrison in Bayamo and had not received any news from us. As far as I was concerned, I still had enough ammunition and intended to make the dictatorshipÂs soldiers pay dearly for my life. Suddenly another car appeared, coming to get me and once again I harbored hopes of helping the compaÃ±eros in Bayamo with an action at the Caney garrison. Several cars were waiting at the end of the avenue where I thought of taking the correct route to this location. But the compaÃ±ero who was driving the car which came to pick me up, didnÂt take the turn and continued to the house from which we had departed during the dawn hours. We changed our clothes there. I changed weapons and took a steel barrel semi-automatic 22 caliber rifle, with a bit longer range than the 12 gauge shotgun. I put some clothes on and with about 15 men Â one wounded Â we crossed a barbed wire fence just a few steps from there. Others left their weapons and took the vehicles trying to find a way out. JesÃºs MontanÃ© and some other leaders were with me. We walked for hours that sweltering afternoon along the north face of Gran Piedra, a high mountain we would try to cross, to move toward Realengo 18, over a steep road described by Pablo de la Torriente, an excellent revolutionary writer who wrote that a man with a rifle could resist an army from there. Pablo, however, died fighting in the Spanish Civil War, in which some thousand Cubans supported this peopleÂs struggle against fascism. I had read him, but was never able to speak with him, since he had already traveled to Spain while I was still in high school. We couldn’t continue on toward that deserted area and we stayed south of the mountain range. The mountainous zone I preferred for the guerilla struggle was located between the Cobre sanctuary and the PilÃ³n sugar mill. I therefore planned to cross toward the other side of Santiago de Cuba’s bay, via a spot I knew since I studied at the Colegio de Dolores, in the city where you are meeting. A large portion of our very small group was exhausted by hunger and fatigue. A wounded combatant had been evacuated and JesÃºs MontanÃ© who could barely remain standing. Another two, with less responsibility, but healthier, left with me toward the west of those mountains. But the most dramatic and less heartening events were yet to come. That afternoon, we gave instructions to the rest of the compaÃ±eros to hide their feeble weapons someplace in the forest and that night head to the comfortable house of a campesino who lived on the edge of the road from Santiago to the beach, who had cattle and telephone communication with the city. They were no doubt intercepted by the army. The enemy, in any event, knew the area close to where we were moving. Before dawn, a heavily armed squadron of the military command, woke us with the barrels of their rifles. The veins in their necks and the faces of those well-fed soldiers were pulsating, deformed by the excitement. We figured we were dead, but in the moment, a discussion broke out. They had not identified me. As they bound me and asked my name, I sarcastically gave one we used in jokes of the worst kind. I couldn’t believe they didn’t recognize the truth. One of them, with his disconcerted face, yelled that they were the defenders of the homeland. With a strong voice, I responded that they were oppressors, like the Spanish soldiers in our people’s struggle for independence. The head of the patrol was a Black man who could barely maintain command. "Don’t shoot," he kept yelling at the soldiers. He whispered repeatedly, "Ideas are not killed, ideas are not killed." At one point, he approached me and quietly said and repeated, "You boys are very brave." Hearing those words, I said, "Lieutenant, I am Fidel Castro" and he responded, "Don’t tell anyone." Once again chance intervened with all its force. The Lieutenant was not a regiment officer; he had some other legal responsibility in the eastern region. Later, even more important events occurred. I gave instructions to the compaÃ±eros who needed to be demobilized to hide their weapons, and we would later take them to the location where they were to make contact with the Bishop’s people. The public in Santiago de Cuba had reacted strongly to the crimes committed by BatistaÂs army against the revolutionaries. Monsignor PÃ©rez Serantes, Bishop of Santiago de Cuba, had obtained some favorable guarantees in response to his appeal to respect the lives of revolutionary prisoners. SarrÃ­a, nevertheless, had a battle to wage against the regiment command which this time delegated the task to one of the most well-known henchmen of the carnage imposed by the chief military officer in Santiago de Cuba, who ordered him to take those detained to the Moncada. For the first time in our homeland, the youth had initiated such a struggle to confront what the country would be until January 1, 1959: a yankee colony. Upon arriving to the local manÂs house alongside the narrow road between the city and Siboney beach, a small truck was awaiting us. SarrÃ­a seated me between the driver and himself. A few hundred meters farther on, we met the vehicle of Commander Chaumont, who demanded that the prisoner be handed over. Like in a science fiction film, the lieutenant argued and insisted that he would not hand over the prisoner, that rather he would deliver him to the bivouac in Santiago de Cuba and not the regiment headquarters. This is how the event [today] brings to mind an unusual experience. It is impossible in such a brief time to express, to our illustrious visitors, the ideas which the incredible times we are living provoke in my mind. I cannot think that within 10 years, on the 70th anniversary, I might write a book. Unfortunately, no one can insure that there will be a number 70, an 80, a 90 or a 100th anniversary of the Moncada. During the RÃ­o de Janeiro international conference on the environment , I said that a species was in danger of extinction: the human race. But then I thought it was a question of centuries. I am not as optimistic now. In any event, nothing worries me; life will continue to exist in the boundless dimensions of space and time. In the meantime, I will say only something, since the day is breaking for all the inhabitants of Cuba and the world. 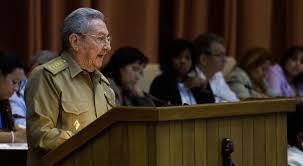 Leaders of all of the more than 200 countries, large and small, revolutionary or not, need to continue living. The task of creating justice and well-being is so difficult that the leaders of every country need authority, on the contrary, chaos will reign. Recently, attempts were made to slander our Revolution, trying to present CubaÂs head of state and government as misleading the United Nations and other heads of state, charging him with duplicitous conduct. I do not hesitate to assure you that although for many years we refused to sign agreements prohibiting such weapons – because we were not in favor of granting this prerogative to any state – we never attempted to manufacture a nuclear weapon. We are against nuclear weapons. No nation, large or small, should possess this instrument of extermination, capable of putting an end to human existence on the planet. All of those who possess such weapons already have enough to create a catastrophe. Fear of dying has never prevented wars in any part of the planet. Today, in addition to nuclear weapons, the most imminent danger is climate change, which could within less than a century make survival for the human race impossible. One Latin American and world leader to whom I wish to render a special tribute, given what he did for our people and others of the Caribbean and the world, is Hugo ChÃ¡vez FrÃ­as. He would be among us today if he had not fallen during his valiant struggle for life. He, like us, did not struggle to live, but lived to struggle.